Rifles and handguns have rifled barrels, that is, spiral grooves have been cut the length of the interior or bore of the barrel (Figure 2.1). Rifling consists of these grooves and the metal left between the grooves—the lands (see Figure 1.13). The purpose of rifling is to impart a rotational spin to the bullet along its longitudinal axis. This gyroscopic effect stabilizes the bullet's flight through the air, preventing it from tumbling end over end. This spin does not, however, stabilize the bullet after it enters the body due to the greater density of tissue compared to air. The term "twist," as it pertains to rifling, refers to the number of inches or centimeters of bore required for one complete rifling spiral. All modern weapons have a twist which is constant for the entire length of the barrel. Some weapons manufactured in the beginning of the 20 th century, had a "gain" twist; in this type of rifling, the rate of twist increases from breech to muzzle. A different form of rifling for both rifles and handguns was introduced by Heckler and Koch. Instead of the traditional lands and grooves, the bore of the weapon has a rounded rectangular profile (polygonal boring) (Figure 2.2A). Muzzle velocity is allegedly increased 5 to 6%. Ballistic comparison of bullets fired from weapons with polygonal boring may be very difficult. Because of this, when one police department ordered their Glock pistols, they specified that the barrels have the traditional rifling rather than the polygonal rifling that is routinely used in Glocks. Figure 2.1 Cross-section of barrel with traditional rifling; right-hand twist. end. Among U.S. handgun manufacturers, the Colt Company is the only major concern that consistently uses a left-hand or counterclockwise twist. The Mark III, manufactured by Colt, was a temporary exception to the manufacturer's policy in that for a number of years this weapon was produced with a right-hand twist. A minority of foreign handgun manufacturers and some U.S. manufacturers of cheap weapons also use a left-hand twist. The majority of domestic and foreign handgun manufacturers, however, use a right-hand twist. Polygonal rifling has a right-hand twist. Figure 2.3 Two 9-mm bullets fired from weapons with (a) left twist and (b) right twist to their rifling. Figure 2.3 shows two bullets, one fired in a weapon with left twist and the other in a weapon with a right twist. 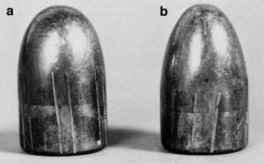 Figure 2.4 shows two .45 ACP bullets, one with traditional rifling marks and the other with markings from polygonal rifling. The number of lands and grooves in a weapon can range from 2 to 22. Most modern weapons have four, five, or six grooves (Table 2.1). Colt handguns traditionally have had six lands and grooves with a left-hand twist, while Smith & Wesson has had five lands and grooves with a right-hand twist. Most centerfire rifles have four or six grooves, with a right-hand twist. Rifle barrels with two grooves were manufactured during World War II for the M-1 Carbine, the .30-06 Springfield rifle, and the British .303 Enfield. A commercial M-1 Carbine manufactured by Universal had a barrel with 12 grooves and a right hand twist. A CDM derringer examined by the author had one barrel with six grooves and the other with twelve. The author has seen handguns of various manufacture, in which the barrel was devoid of rifling do to a mistake in manufacturing. 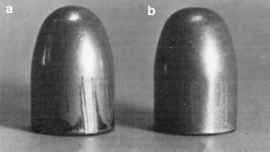 Figure 2.4 Two .45 ACP bullets: (a) with traditional rifling marks, the other (b) with markings from polygonal rifling. Rifles manufactured by Marlin and sold under their own and other names have Micro-Groove® rifling (Figure 2.2B). Micro-Groove® rifling was developed by Marlin in the early 1950s. Instead of 4 to 6 deep rifling grooves, their barrels have 12 to 20 shallow grooves. Marlin rifles can be found in the following calibers: .22 Rimfire, .22 Magnum, .30 Carbine, .357 Magnum, 9-mm Parabellum, .44 Magnum, .45 ACP, .30-30, .35 Remington, .444 Marlin, and .45/70. Weapons chambered for the .22 Short, Long and Long Rifle cartridges have 16 lands and grooves; .22 Magnum 20, and all centerfire rifles 12. All rifling is right-hand twist. 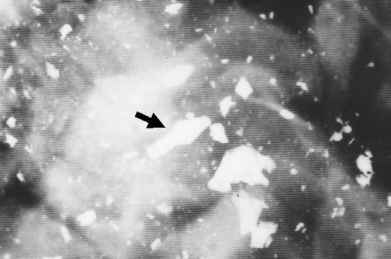 Recovery of a bullet with Micro-Groove® rifling indicates that the individual was shot with a rifle since such rifling is not found in handguns (see Figure 6.2). Jenning's Firearms and Phoenix Arms produce semi-automatic pistols chambered for the .22 LR cartridge that have barrels with 16 lands and grooves with a right twist. Rifling imparted to a bullet fired down such a barrel can be confused with Micro-Groove® rifling. The difference is that Micro-Groove® rifling has extremely narrow lands with grooves twice the width of the lands. In contrast, in Jenning's weapons the lands and grooves have equal widths while the Phoenix pistols have lands that are only slightly narrower compared to the grooves.